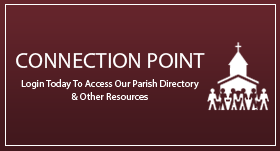 Individuals may register with the parish office at any time. Registration forms are available in the church office and online. Click here to register now. Why should I register as a parishioner? Reasons to register are numerous. Having an accurate accounting of parishioners is helpful to parish staff when planning for liturgies or events, printing correspondence such as church bulletins and recording financial contributions. The parish may quickly and easily provide registered parishioners with documentation required to sponsor a friend or family member for a sacrament of initiation. When is Anointing of the Sick available? This sacrament is no longer received only by those approaching death. It is available upon request for individuals anticipating major surgery, suffering a major chronic illness, or just before the time of death. To request the sacrament for yourself or a loved one, please contact the office staff. How do I dedicate the sanctuary candle? The sanctuary candle located in the Blessed Sacrament Chapel burns for two weeks in memory of our departed loved ones. To dedicate this candle to an individual, please contact the office staff. Donation is $25. Please contact the office staff to inform us when a family member dies. St. Francis of Assisi Parish provides a full Catholic funeral liturgy to parishioners and their family members. Sr. Rose is available to assist with reading and music selections, and the resurrection choir provides music at the funeral Mass. Agape ministry will deliver a meal for up to 15 people to the home of the deceased person’s immediate family. If Henke Hall is available on the funeral day, the grieving family may reserve it for a private reception. How do I donate altar flowers? Our parish decorates the worship space with flowers twice a year—during Easter and Christmas. During these liturgical seasons, lilies and poinsettias, respectively, may be purchased in honor or in memory of a loved one. We also have an In Lieu of Flowers donation option. Learn more here. Mass intentions are available, on a first come, first serve basis. Please contact the office staff to place a request. A $5 donation per Mass intention is suggested.